Blackwater GWOT: Why Didn't They Do This Before? A Western Intelligence source tells that the ongoing terror threat appears to involve up to 20 sleeper cells of between 120 to 180 people ready to strike in France, Germany, Belgium and the Netherlands. The source said that European Union and Middle East intelligence agencies identified an "imminent threat" to Belgium, possibly also to the Netherlands. A terror cell on the brink of carrying out an attack was the target of a raid Thursday that left two suspects dead, Belgian authorities said. A third suspect was injured and taken into custody in the operation at a building in the eastern city of Verviers, prosecutor's spokesman Thierry Werts told reporters. A senior Belgian counterterrorism official told CNN that the alleged terror cell is believed to have received instructions from ISIS. Some members of the cell had traveled to Syria and met with ISIS, which plotted the attacks as retaliation for U.S.-led airstrikes in Syria and Iraq, the Belgian source said. "This was in the framework of an operation looking into an operational cell made up of people, some of whom coming back from Syria," Werts said. "The investigation made it possible to determine that the group was about to carry out major terrorist attacks in Belgium imminently." The operation, which authorities said was ongoing, added fresh fuel to a fear that's been simmering for months as thousands of Europeans went off to join ISIS fighters in Syria. Would they bring the war back with them when they returned home? Belgium anti-terror operation – Police officers gather at the scene of an anti-terrorism operation in Verviers, Belgium, on Thursday, January 15. 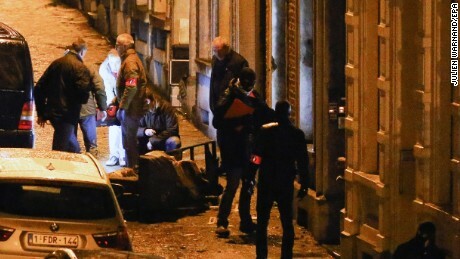 Two people were killed during a raid on a suspected terror cell, Belgian authorities said. A third suspect was injured and taken into custody. Belgium anti-terror operation – Police block a street in Verviers. Police officers work in Verviers after the raid. Belgium anti-terror operation – Police set a large security perimeter in the center of Verviers. A senior Belgian counterterrorism official told CNN that the alleged terror cell is believed to have received instructions from ISIS. The trio targeted in the raid had been under surveillance for some time, prosecutor's spokesman Thierry Werts told reporters. Verviers is about 69 miles (111 kilometers) east-southeast of Brussels. CNN affiliate VTM reported that the terrorism investigation started weeks ago. Frédéric Hausman was inside his house in Verviers when he heard the explosions start. From the window, he saw police officers firing assault rifles at a house nearby. He watched smoke rising after another explosion went off. Then, police entered the house, Hausman told CNN's "Erin Burnett OutFront." And even though he couldn't see exactly what happened next, he heard it. "I can hear it. Everybody can hear it," Hausman said. "In this little city, everybody heard the sound." Shouts, gunfire and the sound of glass shattering echo in a video Hausman posted on YouTube. "The suspects immediately, and for long minutes, fired using weapons and hand weapons before being neutralized," Werts said. Verviers is about 69 miles (111 kilometers) east-southeast of Brussels and 200 miles (322 kilometers) northeast of Paris, where terrorist attacks last week heightened alerts in Europe. CNN affiliate VTM reported that the terrorism investigation in Belgium started weeks ago, and there has been no connection established with the Paris attacks. A Western intelligence source said the Paris attacks played a role in accelerating the timing of the Belgian operation. One reason: The arrest of a Belgian arms dealer suspected of providing weapons to Amedy Coulibaly, the man who attacked a Paris kosher supermarket and also pledged allegiance to ISIS. Belgian investigators questioned him and searched his possessions, the source said. Through the arms dealer, the investigators got a number of "positive hits" on suspected extremists already known to authorities. But in the wake of the Paris attacks, the source said, it stepped up the urgency. The trio targeted in the Verviers raid had been under surveillance for some time, Werts said. Additional anti-terrorism operations are underway in other cities, the Belgian counterterrorism official said. Shift in strategy for ISIS? In recent weeks, European security services received indications of an ominous possibility: that ISIS may have started directing European extremists in Syria and Iraq to launch terrorist attacks back in their home countries, the Belgian counterterrorism official said. The Belgian counter-terrorism official said indications of ISIS ordering attacks in Europe mark an apparent significant shift by the terrorist group. Before the air campaign against it, the official said, there was little indication ISIS leaders were directly plotting attacks in the West. Instead, the group prioritized its project to create an Islamic caliphate. The official named France, the UK and Belgium as countries facing a particular threat. Counterterrorism agencies in Germany also are on high alert because of the number of fighters who have traveled. Several European countries, including Britain, France, Belgium and the Netherlands are participating in the air campaign against ISIS in Iraq. Why would ISIS change tack? Partly because of increased competition between ISIS and al Qaeda affiliates, including the Khorasan group in Syria, to be seen as the standard bearers of global jihad, according to the official. The official said there is also significant concern about Khorasan attack plotting against Europe. U.S. officials previously told CNN that French al Qaeda operative and bomb-maker David Drugeon was suspected to be talent-spotting European jihadis in Syria for operations in Europe. Drugeon was injured in a drone strike in November but is believed to be still alive. Last week, Andrew Parker, the head of Britain's security service MI5, warned, "A group of core al Qaeda terrorists in Syria is planning mass casualty attacks against the West," an apparent reference to the Khorasan group. European officials have been warning for months about the unprecedented challenge posed by returning fighters. More than 3,000 Europeans have left to fight in Syria in recent years. The total number who have returned to Europe is estimated to be over 500, including 250 who have returned to the UK, almost 200 to France and about 70 to Belgium. Several returning ISIS fighters have already been implicated in attack plans in Europe. In February, police in Cannes broke up an alleged plot to bomb targets in France by Ibrahim Boudina, a French-Algerian extremist who allegedly had just returned from fighting with ISIS in Syria. Police said they found almost a kilogram of the high explosive TATP inside soda cans in his family's Cannes apartment building. Screws and nails were attached to one with sticky tape as shrapnel, according to sources briefed on the investigation. Boudina has denied the allegations against him. Mehdi Nemmouche, a French-Algerian ISIS fighter who allegedly helped guard Western hostages in Syria before returning to Europe, allegedly shot and killed four people at a Jewish museum in Brussels in May. acting on their own steam. No evidence has been publicly released suggesting ISIS leadership signed off on the plots. But the worry now is that ISIS has pivoted toward launching attacks in Europe. European officials say all this adds up to an unprecedented terrorist threat in Europe. Late last year, just weeks before the attacks on a satirical magazine, Jewish grocery and police officers in Paris, French Prime Minister Manuel Valls said France had never faced a greater terrorist threat. ISIS runs large training facilities in Syria, has deep financial pockets, and access to thousands of potential European recruits.